Summer might be coming to an end in a few weeks, but we’re the kind of people who love to get every drop of sunshine, nice weather, and outdoor time out of our August as humanly possible! That’s why we’re still working on several outdoor projects that we fully intend to use before the cold weather hits. Some of those projects include different pieces of patio furniture and, as you can probably guess, we’re determined to make them ourselves rather than buying them at the store! If you live in an area that is warm all year round, or maybe if you’re just a an outdoorsy person no matter the temperature, then making your own deck or patio furniture is a great way to customize things to get exactly what you want. We’ve already settled on the designs and styles we want, but there were so many cool ideas and tutorials out there when we were researching that we had a lot of trouble choosing. It took us weeks! Now that we’ve decided, we can’t wait to share the other ideas that we liked and that almost made the cut with other people we know so they can have awesome patios too. 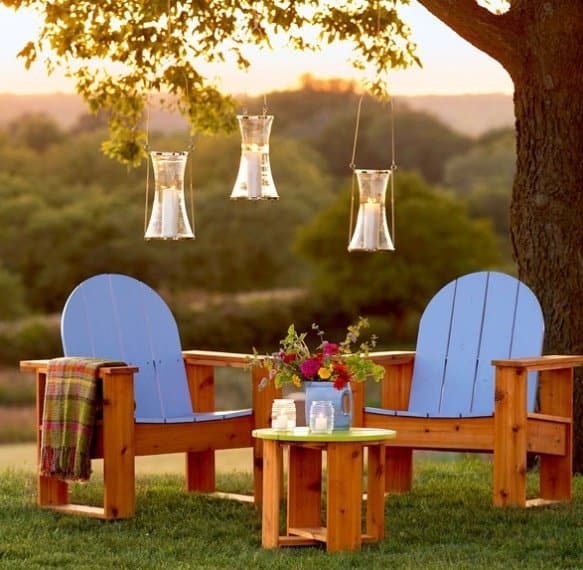 Check out these 15 unique outdoor furniture designs that you could can totally make yourself! Have you been considering making yourself some palette furniture for a while now but you’re just not sure that the neutral colour rustic aesthetic that those pieces tend to create is quite the right style for you? 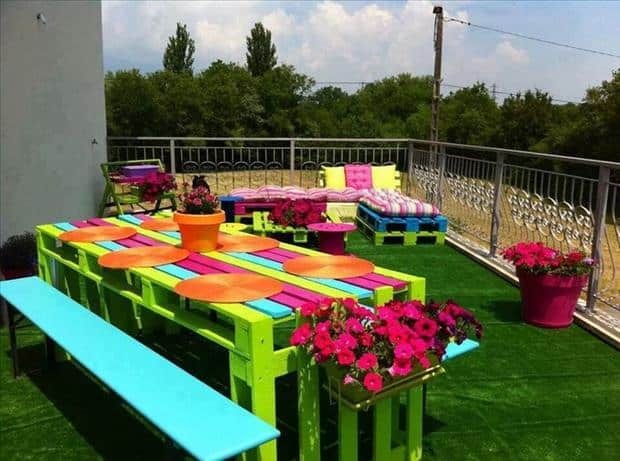 Instead of leaving the wood natural when they made their picnic table and stacked chairs, they painted different parts of each piece another bright colour so the overall finished product looks like a cheerful rainbow! Are you quite experienced in wood working and ready for a bit more of a challenge than just piling some pallets on top of each other? Do you love spending hot weather days on the patio whenever you can, staying out all day to enjoy the sun and the breeze with friends and family? Well, we certainly can’t blame you, because we do exactly the same thing! We always find, though, that we get thirsty after a few hours and going in and out of the house when you’re trying to socialize isn’t convenient, so we wanted to find a way to keep our drinks cold outside instead. That’s why we made ourselves this awesome outdoor wooden crate that has a cooler hidden inside! It lets us keep some drinks cool outside without just plunking an old plastic cooler down in the middle of everything after we’ve dug it out of the garage somewhere. Find out how this version is made on 99 Pallets! Do you live in an area that has lots of farm and estate sales out in the country, so you have access to different vintage and old fashioned pieces that you might not find in stores, or at least not ones that look really authentic and stylishly worn? Then you’ve already finished half the battle for this project! Finding an old vintage milk crate is almost all you need to do. 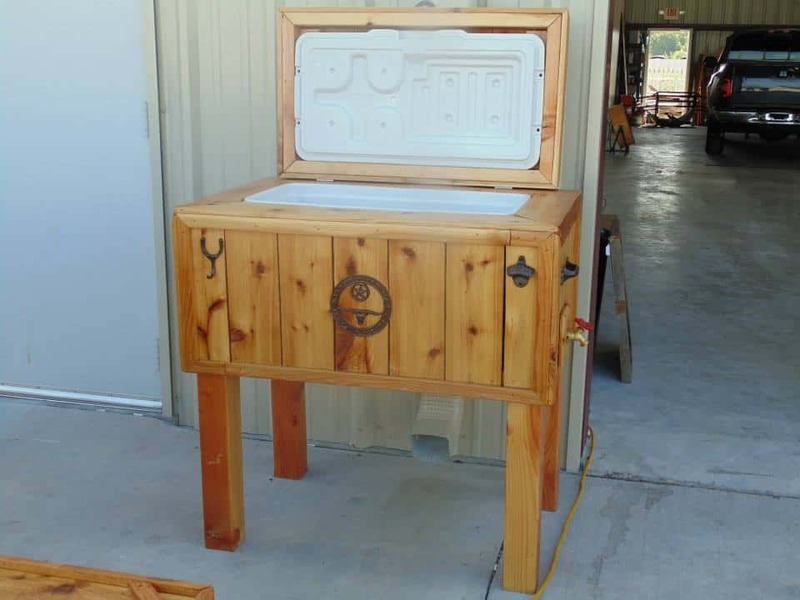 The Girl Inspired will teach you how to put the top on to make an awesome outdoor side table. Have you always been a big fan of wooden pieces, but you like both making, using, and looking at them better when they’re made out of natural branches and trees rather then evenly cut planks? 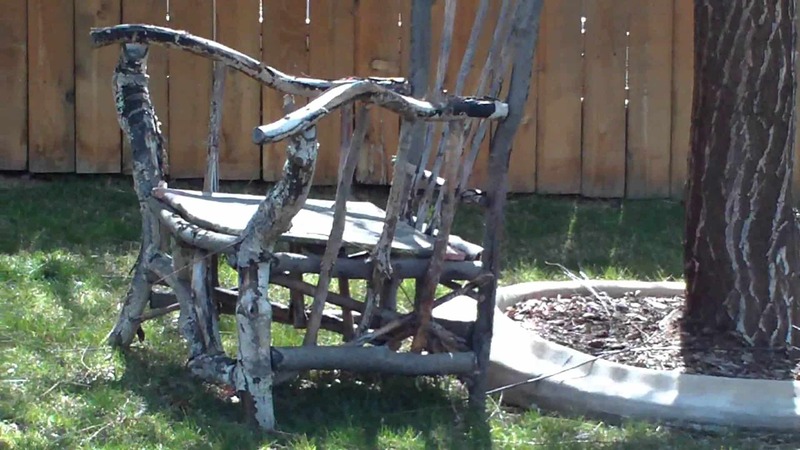 Then you’re going to love this awesome branch chair design from Donald Sawyer! 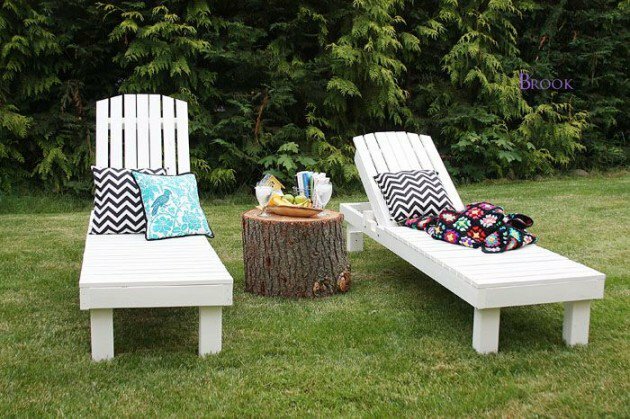 They’ll show you how to make an outdoor seat that that looks perfectly imperfect but still features a seat that sits straight. Are you very interested in making outdoor patio chairs of your own but you think you’d rather have a straight, clean cut look rather than a naturally rickety branch style seat? In that case, perhaps you’ll prefer a project like these slightly leaned back lounge seats that are made from upcycled fence posts. If you have a little bit of woodworking experience, we think you’ll be surprised at how simple these chairs really are to make! Check them out in more detail on Killer B Designs. Are you intrigued by the idea of making outdoor chairs to lounge in but your favourite kind of chair is usually a nice, deep rocking chair? Well, don’t dismay quite yet because you’re not out of luck! 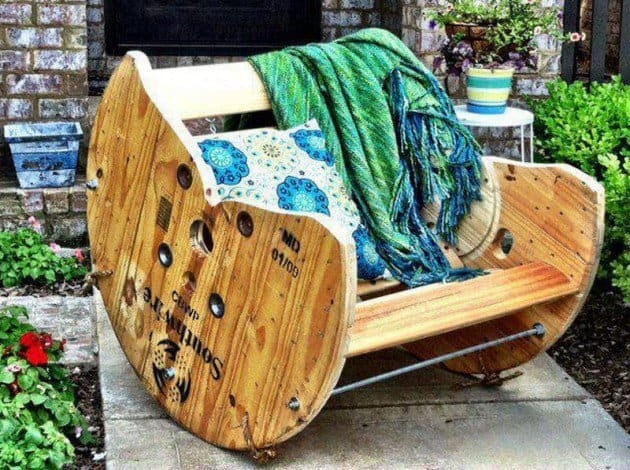 DIY Pallet Furniture has an awesome tutorial that guides you step by step through the process of making your own rocking chair from a large wooden cable spool that’s been emptied. Maybe it’s not you that you’re making the chair for because you already have some, but your kids or smaller family members could use a nice place to sit too so you can all sit out in the sun together? 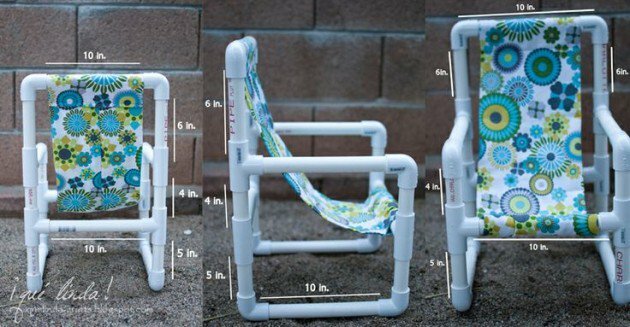 Well, they might not like the feeling of the wood on their little legs, so check out how Quelinda Crafts made these little porch chairs from PVC pipes for the frames and fun, brightly patterned fabric for the hammock style seats. 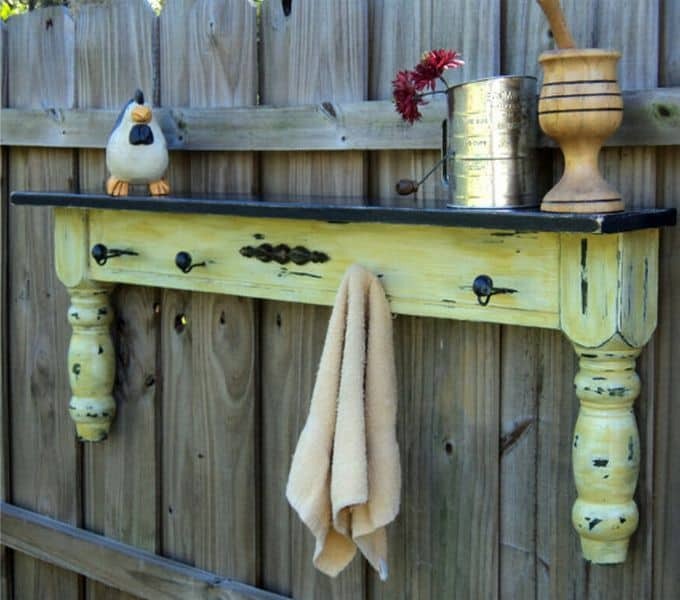 If you’re going to make a piece yourself and have things that really suit an outdoor aesthetic, do you prefer that they actually look clearly upcycled so people can see how creative you’ve been in making it? 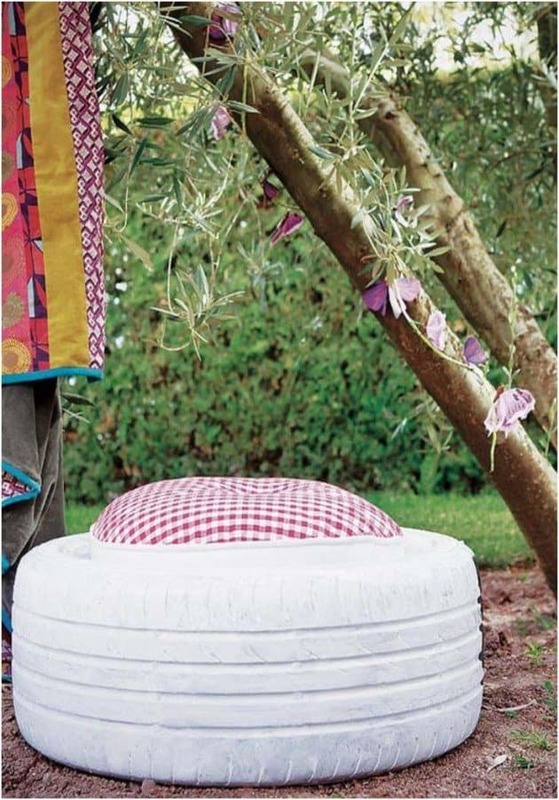 In that case, we have a feeling you’re going to love this awesome car tire ottoman design from DIY Enthusiasts! This project has a little bit of everything; you’ll get to paint the tire and sew, fill, and position the cushion on the inside of the tire. 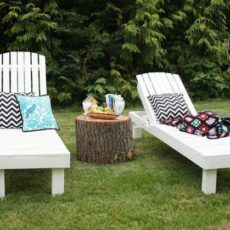 All these chairs might seem like great ideas because lots of seating options outside is always great, but what if your favourite way to enjoy time outside is to lay down? Whether you’re napping, tanning, or reading a book, sometimes having an actual space to stretch out is the best thing ever! That’s why we love these long lounger chair designs made from pallets by Ana White! Are you the kind of décor enthusiast who loves to be able to change things at a whim because your tastes are always shifting and you’re always busy and doing new things? In that case, why not make yourself a patio that you can change around as you please depending on what you’re doing and how many people are coming over? These rolling stools, side tables, and stacked pallet chairs from Ryan Frank are a great option for you in that case, and they’re another design that you might find a lot easier to make than you’d originally think. Speaking of pieces that move and roll around when you need them to, here’s an awesome alternative option from BHG, just in case you need another mobile idea but you’re interested in including another style! 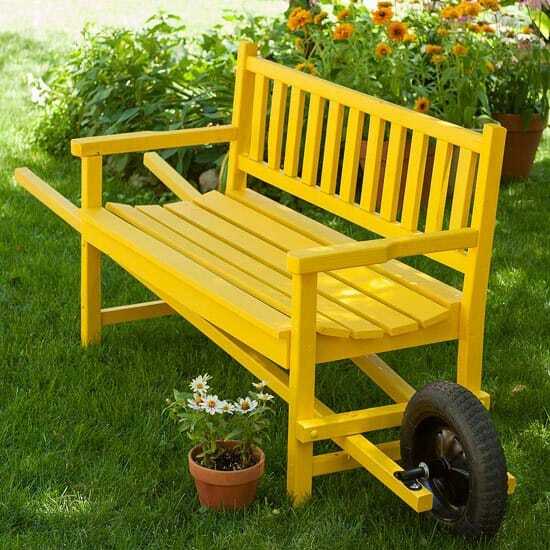 We love the way this bench picks up and rolls away just like a wheel barrow would! We also enjoy that it’s double wide so more than one person can sit on it together. 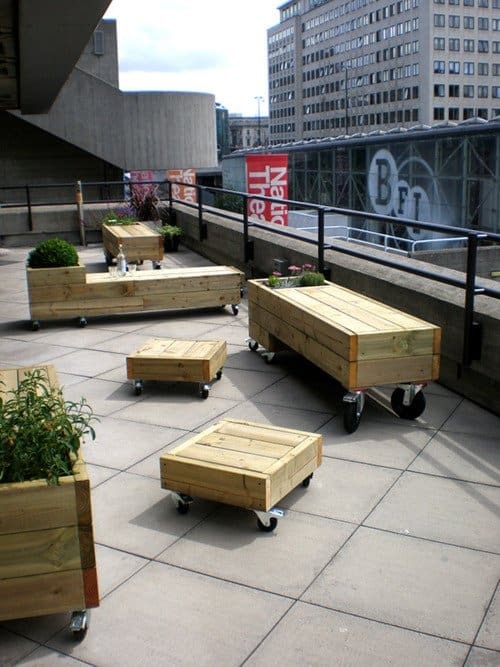 That’s a great idea for family seating! Do you actually spend so much time in your yard that you’ve built yourself a little comfort area for when you’re gardening, so you can set things like your drink or your phone down while you enjoy the outdoors? Are you also the kind of person who appreciates a cute, kitschy style no matter where you’re going? 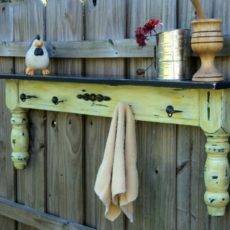 Then we have a feeling you’re going to appreciate this funny little sectioned table idea that hangs on the fence and gives you a spot to hang tools and place trinkets, almost like you would inside. Check out how this piece was made on Recyclart. 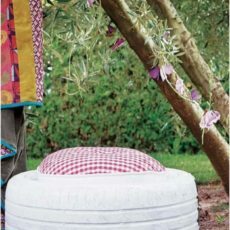 Did you love the tire ottoman idea we showed you before but you live in an area that rains a lot and you’re concerned that stuffed fabric won’t hold up well in an outdoor area because of the wet weather? 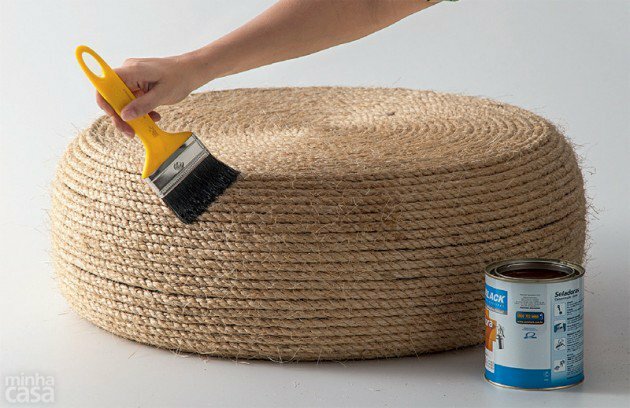 In that case, perhaps you’d prefer this hardier rope wrapped tire ottoman design instead! You might even treat the rope when you’re done so it handles weather even better. Find out how it’s made on Handimania. Are you new to this whole furniture making idea and feeling a little intimidated by the idea of working with wood, so you’re looking for something a little bit simpler than what we’ve shown you so far? 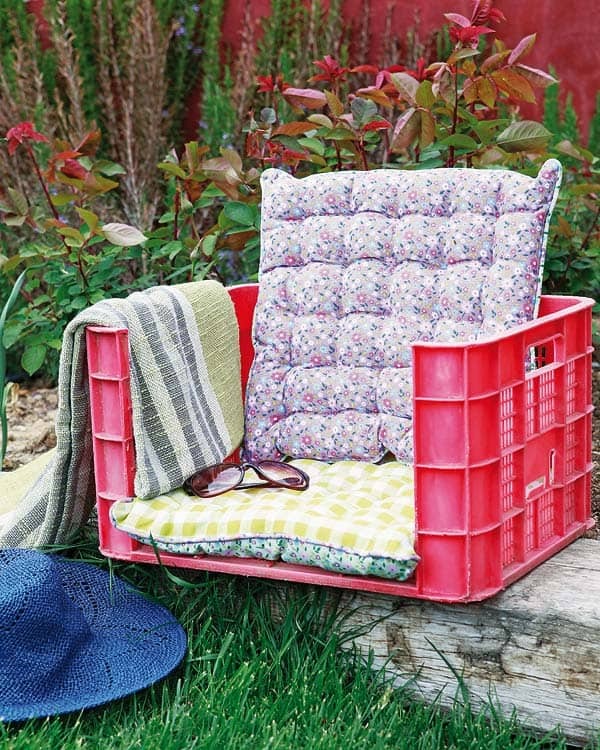 In that case, maybe you’d prefer to make this plastic crate seat from DIY Enthusiast! They’ll show you how to cut a side section out, make a cushion, and set it up near the campfire pit so you have somewhere to lean while you enjoy your family’s company. We know we’ve talked a lot about pallet furniture so far, but there are just so many different outdoor furniture pieces that you can create with them that we’re a little bit obsessed by now! 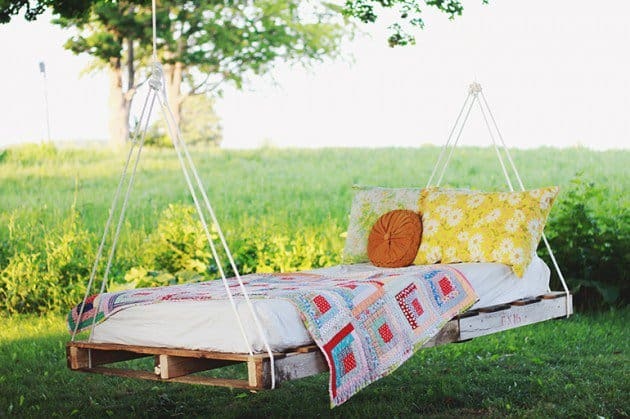 One of the best pieces we stumbled upon on our search for awesome outdoor furniture was this pallet tree swing by The Merry Thought. We can’t think of a better place to enjoy a beautiful afternoon read on a summer’s day! Just make sure you remember to bring in the soft pieces in between naps so it doesn’t get caught in the rain! 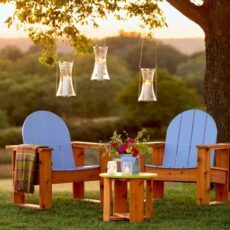 Have you made other awesome DIY patio, lawn, and outdoor furniture before that you’re very happy with and use all the time but that you don’t see on our list? Tell us all about how you did it or link us to pictures of your work in the comments section!